I could probably make a thousand different video introduction to my book The Sea is Wide: A Memoir of Caregiving. Well, maybe ten. Point is, there are so many different important things I want to share about my book and they can’t all fit in one video. And there are some ideas that I could present in several different types of videos. This is a long way of saying I had to restrain myself and pick just one idea, and one way of presenting that idea, for the first video introducing my book. It turned out mostly how I wanted. Give me a couple of months and a better version of software and it could be tons better, and more polished. But I don’t have all the time in the world, and I don’t have better software. So with what I have–yeah, it got across what I wanted to communicate. And what was that? In this case I wanted to convey more a feeling than information. I tried, as best I could, to make the person watching the video feel what I felt caring for Grandpa. I wanted them to feel the feelings I tried to convey in my book. I think I managed to do that. Watch, and tell me what you think! Special Free Sale of The Sea is Wide! 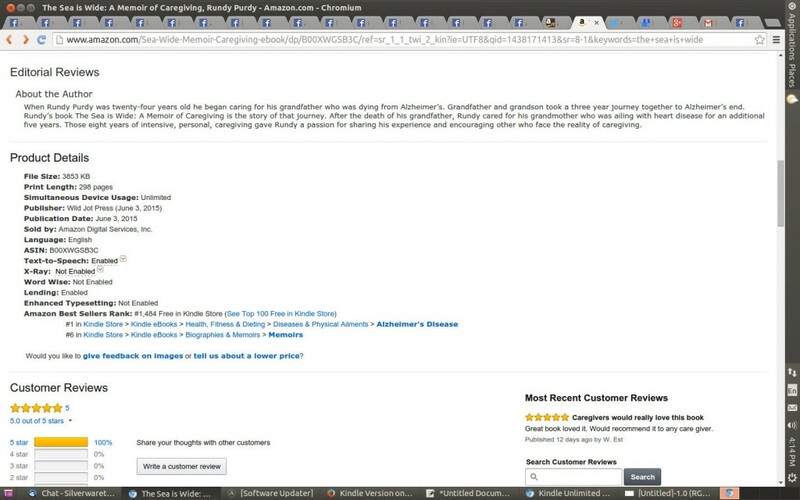 Right now we have a special sale going on for the Kindle version of my book The Sea is Wide: A Memoir of Caregiving. From July 29th to August 2nd the kindle version of my book is available for free. Get a copy and you will have it forever (well, for as long as Amazon exists). You will be able to lend this book to other people who have a kindle, so even if you don’t have a kindle get yourself a copy. It is something you can share, and it will help give me exposure so I would really appreciate it. I was remiss in not mentioning this a little earlier, but better late than never! The Sea is Wide: A Memoir of Caregiving won’t be published until June 3rd, but it is available now for pre-order on Amazon Kindle. If you would like to reserve a copy for your Kindle now, head on over to Amazon. If you have any family or friends with a Kindle, share the link with them. When the clock ticked over from Friday night to 12:01 AM Monday, my Pubslush crowd-funding campaign came to an end. If you were watching the website then you know the final numbers at Pubslush were 40 contributors, and a total of $4,820. However, if we are being completely precise an additional four people wanted to contribute off-line via physical check, which added an additional $280. So the real total, which wasn’t on Pubslush, was $5,100. When I was first contemplating the idea of doing crowd funding I struggled to imagine ever raising $5,000, and here we are! It has been a journey of thankfulness and humbleness. This has been a great success, but I set a goal of $13,000 which has lead some people to ask what I am going to do since I didn’t reach that amount. First, since I didn’t use the Kickstarter website (which has a policy of all or nothing funding), I keep the money I raised even thought it didn’t reach my ultimate goal. That $13,000 goal would have provided me with funds to effectively reach the most people possible, but $5,000 enables me to reach more people than if I had raised none. So $5,000 is a much more modest start than charging out the gate with $13,000 to fund my efforts, but that $5,000 will enable me to reach many more people than I otherwise would have been able so from that perspective it is a huge success. Coming short of $13,000 does put some limitations on me, but this is all anything but a failure! Many of you reading this were contributors to the effort. I admit it was hard for me to feel like I had adequately expressed my thanks to everyone–even with the email thank you I sent, and the rewards sent and yet to be sent. So I am saying thank you again to everyone who got behind me and lent their support to this journey. Your vote of confidence means a lot. I think the greatest tangible sign of thankfulness you could all receive would be to see the gratefulness on the faces of those who will be comforted and encouraged by my book. That will be the result of what you have all done in supporting me, and so that is what I want to give you all for joining in. Unfortunately, most of you won’t be there when people receive and read my book. But perhaps you can imagine it. Additionally, here is a video I shot with me reading an excerpt from the book.